I'll never forget that fateful morning a few years ago when Amy Brown turned my world upside-down. I was just out of bed and getting online, before coffee (as is my unfortunate habit), when I discovered on the Mobius Film Discussion Boards a posting from Amy announcing her discovery of two forgotten EPs recorded by the late Spanish actress Soledad Miranda in 1964 and 1965. I had written a seminal appreciative essay about Soledad -- unforgettable as the Dark Lady of such Jess Franco sonnets as VAMPYROS LESBOS and SHE KILLS IN ECSTASY, tragically killed in an automobile accident in 1970 -- so I had very specific feelings about her and who she was. Therefore, it came as a great shock when I set eyes for the first time on the picture sleeve of her first Belter Records EP (pictured above), which showed this apparition of silken severity sporting a most unlikely goofy grin and a tousled blonde hairstyle that made her look like the Peggy Lee pooch in Disney's LADY AND THE TRAMP. Without her name there, I would never have recognized her in the photo. I gawked at it and gawked at it and thought I had finally lost my mind. 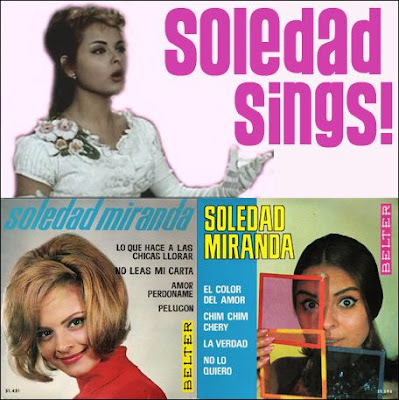 The Soledad I thought I knew was somewhat better represented by the picture sleeve of her second and last EP (pictured above), which showed her, still with that zany look in her eyes, peering through a fistful of color gels -- apparently a nod to "El Color del Amor," one of the songs therein featured. She was more recognizable, but the whole thing still struck me as unbelievable, not least of all because this EP also found the star of EUGENIE DE SADE singing "Chim Chim Cheree" from Walt Disney's MARY POPPINS! What did this exquisite creature, the very epicenter of Spanish horrotica, know about being a chimney sweep? Since Amy's discovery of these rare records, their exposure has been limited to sound bytes on her valuable website soledadmiranda.com, but now the site is making all eight tracks from the two Belter EPs, with other rare and pertinent tracks, available on CD-R as SOLEDAD SINGS! Also included on the disc are previously unreleased musical performances taken from the soundtracks of the films CANCION DE CUNA (1961), EVA 63 (1963) and CURRITO DE LA CRUZ (1965); sound bytes from the movies SOLTERA Y MADRE EN LA VIDA and 100 RIFLES; and three tribute songs performed by American Boyfriends and Papillon. Listening to this body of music is a strange experience because so much of what we (or, more to the point, I) know about Soledad Miranda is dissociated from her real voice. Therefore, the music brings us into more direct personal contact with her than even her movies allow; in her films she is playing characters and often speaking with someone else's voice, but, whether they are suited to her or not, these songs reflect her own interpretations. The first Belter EP finds Soledad attempting to demonstrate her musical range with three poppy "yé yé" numbers and a ballad. The notes explain that she was accompanied by The Latin Quartet, but I suspect this was the name for the background singers as the instrumentation includes piano, alto sax and vibes, as well as the instruments usually associated with pop music. Soledad's voice is equal parts perky and smoky, and she seems to be having fun on the twisty dance numbers "Pelucon" ("Big Wig") and "Lo que hace alas chicas llorar" ("What Makes Little Girls Cry," which finds her singing "Ai yi yi, shooby-dooby dum day!"). The piano/organ ballad "Amor Perdoname" ("Pardon Me, Love") gives her opportunity to introduce an element of drama to the record and is the track where she seems to feel most at home. A third yé yé number, "No leas mi carta" ("Don't Read My Letter") is interesting for the way her vocal performance doesn't quite match the energy of the accompaniment; she sounds as though she is recording the song under duress. Taken collectively, the EP has the feel of a project undertaken purely for PR purposes -- to make Soledad better known to young people and the filmmaking community -- rather than a work of genuine self-expression. The second Belter EP, recorded with an orchestra led by Adolfo Ventas, is more musically satisfying. While she doesn't bring anything to "Chim Chim Cheree" that you haven't heard before, hers is not an insincere performance and she does remind us that this song, much like "My Favorite Things" from THE SOUND OF MUSIC, attracted the respectful attention of many outstanding jazz artists of the time. The remaining three tracks find Soledad finally blossoming as a recording artist. 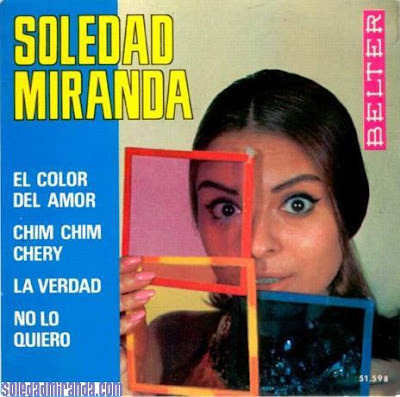 "El Color del Amor" ("The Color of Love") is very much the musical performance Soledad's fans will be hoping for, a Gene Pitney-like ballad with a chilling, orchestral backdrop that seems to reach out from the grave; "No lo Quiero" ("You Can Have Her") builds from a pizzicato opening to a performance of almost gospel fervor; and "La Verdad" ("The Truth," which Soledad sings as "la verità") finds her singing well to a jerky beat, though the song seems badly mixed with the rhythm section too much up-front. The sound quality on these first eight tracks is acceptable, not as crackly as you might expect old vinyl to be, though the audio is subject to distortion when the performance gets loud. It is actually in the songs recorded for the three aforementioned films that Soledad's singing sounds most natural and heartfelt. The three songs from CANCION DE CUNA, a movie set in the late 19th century, have an operatic quality to which her voice seems ideally suited. In EVA 63, set in 1963, Soledad actually played a young woman named Soledad who aspires to a singing career, and in these songs she ventures into gypsy and flamenco music, mostly a cappella, that again feels bright and genuine. The two songs from CURRITO DE LA CRUZ, a bullfighting melodrama, are bolero-like dirges sung at the funeral services for two matadors -- almost identical in character, but nevertheless moving. Following a few curiosity-satisfying tracks that offer Soledad's own voice speaking Spanish and English, and another that reveals how her name is pronounced, are the tribute tracks. "Soledad Miranda" by American Boyfriends is light, romantic pop with lyrics specifically addressing her mystique, while "Soledad" and "Miranda" -- two songs by the French electropop group Papillon -- are more oblique tributes, but (for me, personally) more satisfying. Sleek sophisticated pop with a dark, enticing undercurrent that left me wanting to hear more. As a piece of construction, this CD-R has its rough edges -- it's not chronological, some of the audio clips from movies end bluntly, and the dialogue cues might have been more comfortably sequenced as a postscript after the music -- but, if any project's success can be measured by how it excites your imagination or curiosity, SOLEDAD SINGS! is a winner. Not only do I want to hear more by Papillon, but the songs from the three movies made me want to track them down (fortunately, they're available from Amy's site) and explore the totality of this woman's screen career; I don't expect the films to be better than EUGENIE DE SADE, but I expect I'll know Soledad Miranda better after seeing them. The disc also stands as a jagged but persuasive argument that, had she survived, Soledad might well have followed her work for Franco with a serious recording career, much as Daliah Lavi -- the Dark Lady of Mario Bava's THE WHIP AND THE BODY -- enjoyed in Germany in the 1970s and '80s. Would that she had that chance. SOLEDAD SINGS! is available for $10 (CD alone) or $14 (CD with a separate 10-page color brochure) postpaid within the United States. Order by sending PayPal payment to Amy at inkybrown@hotmail.com or by sending a money order to Amy Brown c/o Cliburn, 2525 Ridgmar Blvd. Ste. 307, Fort Worth TX 76116. Those who live outside the US are asked to inquire about specific postal rates by writing to Amy at the aforementioned e-mail address. Those who need more than my word for it are referred to a special page at Amy's site here, where samples of the various tracks are archived.